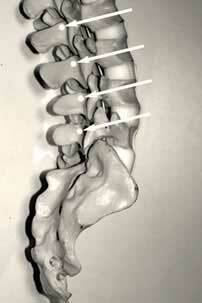 This photo demonstrates the anatomical position of the nerve that is being targeted in a radiofrequency rhizotomy. The nerve curls into the facet joint from here and supplies the joint of pain sensation. The aim is to inactivate this nerve so that the pain signal that originates in the joint does not travel to the brain, and relief of symptoms is achieved. A lumbar RFR procedure is performed for pain that is caused by damaged facet joints. The aim of the operation is to temporarily paralyse the very small nerves that supply the facet joint of pain sensation. This will then bring partial or complete (but usually temporary) relief of the pain, spasm and referred pain that these damaged facet joints can cause. When undergoing this procedure, you will be lying on your stomach on bolsters or pillows. Your specialist will use an X-ray machine to guide the needles that are used to do the procedure with. A very thin electrode is inserted through the needles and the nerve that supplies your facet joint is stunned or damaged by radiofrequency generated by a radiofrequency generator. This procedure is frequently performed following a succesful facet block. These are not majorly important nerves and it is not dangerous to inactivate them with radiofrequency pulses. When inactivated, these nerves cannot conduct pain sensation from the joint to the brain. This means that the pain sensation from the facet joints decrease or clear up completely. This is, however, a temporary effect and the treatment has to be repeated when the pain returns. Some of the effects are immediate, but it is quite normal that you may experience pain for about two to three weeks after the procedure. Maximum pain relief is usually experienced at about six weeks after the procedure. The effects can last for a year or more. Not all people have relief from this procedure and the success rate is quoted as being between 40% and 75%.